Home / sports news / Hazard calls for referees protection "I'm feeling wear and tear of opponents’ rough treatment"
Hazard calls for referees protection "I'm feeling wear and tear of opponents’ rough treatment"
Eden Hazard has made the frank admission the aggressive treatment that he is often subjected by his markers is starting to take its toll on his body. 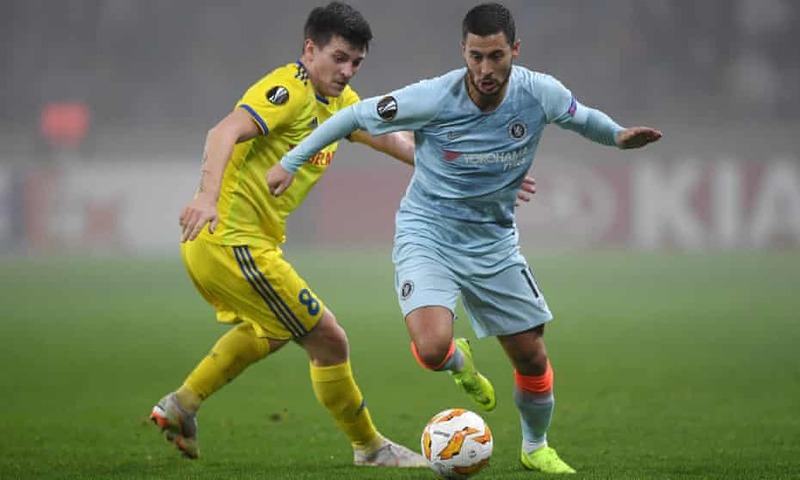 The Chelsea forward, who made his first start in almost three weeks when playing a little over an hour in Thursday’s Europa League win at Bate Borisov, has been fouled on average once every 24 minutes in the Premier League this season, 28 times altogether. While there have been more fouls on Wilfried Zaha (32), Will Hughes and James Maddison (both 29), that trio have all played considerably more minutes than Hazard’s 693 in the top flight. The aggressive tackles are starting to have an effect on the Belgian, now in his 11th season as a first‑team regular with Lille and Chelsea. “I’m 27 now and starting to get older, so I have to take more care of my body,” he said. “I am feeling the wear and tear. I have been playing football as a professional for more than 10 years now. It is part of the game, I guess. I am not happy but it’s part of football. The referee tries to do his job and I try to do mine. I guess when I am on the floor I can win free-kicks, so every free-kick with Chelsea is a chance to score more goals.” Only Zaha (229 in 6,476 minutes) has been fouled more than Hazard’s 211 in 6,127 minutes in the Premier League stretching back to 2016, with the Belgian echoing the Crystal Palace winger’s recent call for referees to clamp down on teams sharing culpability for the offences and potentially avoiding punishment. “For me that would be better,” said Hazard. “For the referee, though, it can be hard to show a yellow card in the first minute. Everywhere it is the same for me.” Hazard, the Premier League’s joint top-scorer so far this season with seven, had been expected to play a half in Belarus but with the tie still goalless until early in the second half he ended up featuring for 62 minutes. He is being assessed at Cobham but should be fit to begin against Everton on Sunday, albeit with Maurizio Sarri and the club’s medical staff monitoring his work-load with nine games scheduled for December. Hazard – who has taken up yoga in his time at Chelsea – does not anticipate travelling to Budapest for the team’s final Group L fixture next month against Vidi, with qualification already secured and the section likely to have been claimed by then.